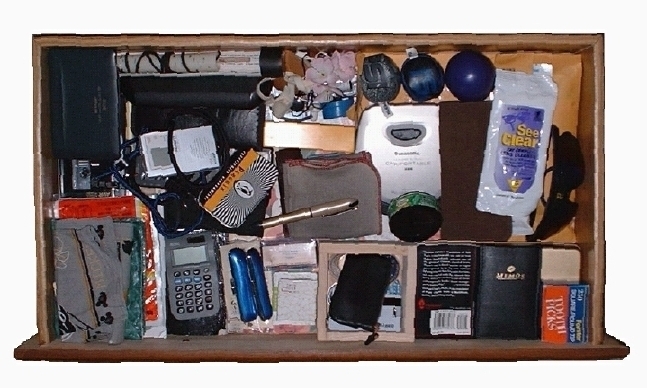 What can you learn from the contents of someone's Junk Drawer? I have no idea. But I'll bet that there are a lot of egg-heads out there who do. I thought it might be somewhat amusing and insightful to let you see the contents of my Junk Drawer. Buffing cloth (Shows signs of continuous use). Semi-clean/dirty handkerchief (At least it's not stuck together with coagulated snot). One pair of Pirates (as in the Baseball team) sunglasses. A Seiko dress watch. Gold colored, with silver metallic band. Inscription on the back reads... "Papermakers local 47 R Vassen (They spelled his name wrong) 1955-1988" (Extremely scratched up, but still running). Casio flip top databank calculator watch (Black in color, clunky cheap piece of plastic. Not running). Timex watch (Fatigue green in color. Cloth band, analog face. Dual hour listing; 1-12 and 13-24 for military type time. Not running). Timex Expedition wrist watch (That's the kind with the twist and pull alarms. Brown leather and cloth band. In good condition). Timex dual display wristwatch (It's got both a digital and an analog display. The analog face is number 13-00, as in military time. It's working. Let's see the time is... 11:42). Timex Indiglo watch (Silver metalic finish and band. Twist & Pull alarm type. It's working). North Crest wrist watch (Broad forest green velcro band. The band also has a small compass attached to it. It's running). O.k. What's this. A rather odd watch. It's a Apple COmputer watch. It says 'Think different' on the face, and it's running Backwards? Yeah, the numbers run counter-clcokwise around the face, and the hands are moving counter-clockwise. That's certainly 'Different'. Has one of those cheap velcro straps, and it's running.. Backwards! A black fabric wrist band with no watch attached. Two pieces of a very slender black leather wristband. A woman's wrist band? Casio watch instruction manual (Manual is for model number 676. The manual is in German? It's for one of those calculator watches). Another Casio watch instruction manual (This ones for model number 761, and the manual is in English It's for that flip top watch). A Leatherman Super Tool instruction booklet. Instruction manual for a Memorex 32 minute Digital Voice Recorder with VOX. Model MB005. Hohner Pocket Pal harmonica (Worn and scratched, but still in tune). It's inside a brown leather 'Leatherman' belt case. Black storage case for laser pointer (There's a single AAA battery in the case). Black nylon rope thingee. Looks like you would wear it around your neck. It's got a detachable circular key ring at the end? White electronic pedometer (Miles 2.92, Steps 03110, Time 12-14). Tan eye patch with white elastic straps (The real thing. Cheap and ugly. Made of plastic, has a large hunk of white foam on inside/backside of patch). Sharp memo master alarm (Black in color, model number EL-6590. Functional, let's see... Contains, names, email addresses, phone numbers, dates of important events... quit smoking on July 1st 1990) O.k. that's enough, I've only got 30 minutes before he get's back. Pepsi® Hacky-sack (Grey in color, not very worn) Is Hacky-sack a TM? Another Pepsi® Hacky-sack (Blue in color, no signs of wear). A purple ball. It's firm but squishy. Says soft spot on it. I'll bet that's some kind of stress relieving device. This is that identification badge I saw earlier. It's connected to some sort of retractable cord (Plastic laminated badge. Sure looks official. It's got his name, height, weight, and other identifying characteristics on it. Must be for work). Metal coin (Coin is inscribed on one side with "301st Intelligence Squadron, Ne plus ultra" (Sure wish I could read Latin). On the other side it says, "Anywhere, Anytime. freedom through vigilance". Whatever). A tube of Chapstick lip balm. The original flavor. Yuck! Zebra pen and pencil set (Silver barrels, black grips. Style F-301. They both work. Black ink, .5mm lead). A leather coin purse (Contains... Lot's of coins. All american, including some of those golden dollars. has an attached key chain with two small keys). Another metal coin (This one says something about 'United States Air Force, Non Commisioned Officer'. Next). Another metal coin... This is getting boring (Sapporo Snow Festival Tour 2000, Four Seasons Travel. Same on both sides). Where's Sapporo? The last coin. Currency this time. One of those Golden dollars. Rather tarnished though. The last thing in the wooden box is a button. For clothes; says Eddie Bauer on it. Two tangled headphone plugs. Those monaural earplug type. (One is white, and the other is black. The black one has a clip to hold the jack in your ear). A key chain (Says... "Hirosaki Cherry Blossom Festival 99'" No keys). One package of Griffin® Boot laces (54 inches long, Coppery tan colored. Package is unopened). Three pieces of paper from a notepad (Contains lists of trees. Different types of trees). Two packets of Sight Savers® lens cleaning tissues. One appears to be almost empty, the other seems unopened. An OPTI laser pointer (Black in color, functional. Red tightly focused pin point). Uniform patches wrapped together with a rubber band. Four 566th Informations Operations Squadron patches; 'Always Vigilant, Never Weary'. Four Air Combat Command patches. Silva® precision compass (In original packaging. The packaging has been opened, but he put the compass back inside with the papers/instructions). Case for Geoffrey Beene eyeglasses (Contains a pair of cheap sun glasses with blue tinted lenses. Made in Taiwan. Under the sun glasses is a sealed packet of Sight Savers® lens cleaning tissues). Two elastic cords (What are these for? They're braided elastic cords with metal hooks on each end. About 8 inches long). Vinyl glasses case (Contains one pair of obscenely ugly 'Birth Control' glasses with dark brown rims. They appear to have been manufactured to be worn by someone with a completely flat face, and square head. Unscratched). Several pieces of paper. They appear to be eyeglasses prescriptions. Vinyl glasses sleeve (Contains a pair of eyeglasses. Almost round lenses. The arms of the glasses end in those hoops which wrap around the ears. The lenses are covered with several very fine scratches. Must have some sort of plastic coating). A brown imitation suede glasses case (Contains a pair of fairly nice looking half rim eyeglasses. These are the Geoffrey Beene rims from the case I noted earlier). Unopened package of Potable Aqua® tablets (It's a bottle of those water purification tablets. The bottle contains 50 tablets. Price tag $4.50). Two packages of Puffs® extra strength unscented tissues (Opened, some of the tissues are missing). An orange plastic package that contains... what is this? (The entire package is written in Japanese, except for a couple of things. Brand name: Mycoal®, and some temperature markings. 68°C and 54°C. There's also a couple of pictures. Ones an outline of a hand, the other is an outline of a person). International certificate of vaccination. Yellow shot records (Shot records documented in several different languages. This guy's been immunized against just about everything. The records are full. This must be an old one. No Anthrax vaccinations listed here. The most recent immunization appears to be a Hepatitis A shot on 14 Sep 98. Manilla envelope containing... Savings bonds! (Numerous bonds, Series EE, 200 hundred dollar bonds) Hope the place doesn't burn down. I wonder if you can get replacements? Plastic case containing four 'The PFE made easy' audio cassettes (The box is taped shut with masking tape. I wonder if it really contains PFE study tapes? A mini casette recorder containing one of those PFE study tapes (Nice recorder. Uses standard audio cassettes. It's got one of those voice activated microphones. It works too). Instruction manual for a Canon Rebel 2000 camera. Instruction manual for that Sharp Electronic Organizer I saw earlier (Model EL-6590). Instruction Manual for a Fujifilm Digital Camera (Model FinePix 2400Zoom). One Namz name stamp with inkpad. Stamp has stylized name 'Robert'. Small white box with Japanese characters on it. Contains black plastic ink pad with red ink. Small white box with Japanes characters on it. Contains six wooden rubber stamps with various nature themes: Fish, Birds, Shells, Crabs, Flowers, Grasses? Two blue pastic cases with metalic trim. Labelled 'Robert', and 'Vaessen'. Each one contains a small wooden rubber stamp and small ink pad. I'm assuming they say 'Robert,', and 'Vaessen' in Japanese? Two wooden rubber stamps in plastic envelopes. They appear to be Japanese again. One is labelled 'Robert', the other has no label. A small circular plastic container. Labelled 'Ear', inside is... Forget that, I'm not openning this thing! A black cloth case for a Leatherman tool. Contains a Leatherman Super Tool. The instructions for it were in that gold box noted earlier. Royal 8 digit calculator. The solar/battery type. A sealed packet of Baush & Lomb Sight Savers® Pre-moistened lens cleaning tissues. A radio Shack memory pocket tone dialer. Wierd! Is this for automatic phone dialing? An eyepatch? A plastic and foam eyepatch with elastic straps. Looks like something he may have got at the hospital. Definitely not the attractive pirate type of eyepatch. A black portable travel alarm clock. Rather small and compact, folds shut. A metal mint tin. Contains Penguin® mints. They're caffeinated? A Memorex® digital recorder. 32 minute VOX (Voice) activated recorder. I remember seeing the instruction manual earlier. Lets see... "Message nr. 01: Charlton Hestons character in the Omega Man was; Col. Robert Neville" O.k... That's some serious trivia for you (Model MB005-04). What the heck is this?... A bunch of small plastic flowers. Cherry blossoms on a twig? One of those metal fastener clips. The kind that work much better than staples. Small, I'd estimate it would hold appx. 100 pages of paper. This page has been accessed times since Sun, Oct 31, 1999 08:58.